U.S. finance chiefs see earnings growth in 2018, but they also expect higher wage and benefits costs. Happy days are here again? For U.S. finance chiefs, it seems, they are. At least that’s the prevailing mood since Congress passed the Tax Cuts and Jobs Act, the biggest overhaul to the tax system since 1986.
Business optimism among finance chiefs in the U.S. and some other countries reached record levels in the fourth quarter of 2017, according to the more than 800 CFOs responding to the latest Duke University/CFO Global Business Outlook Survey. 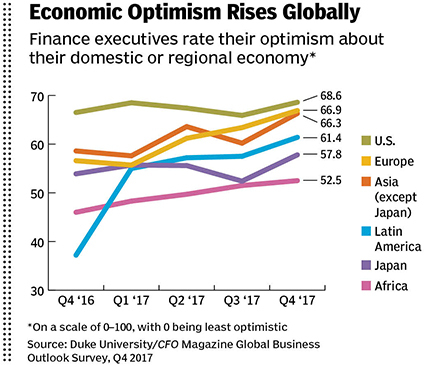 The survey’s CFO optimism index in the U.S. rose to 68.6 on a 100-point scale, the highest recording of 2017. (The lowest was 65.9, recorded in the third quarter.) Among the CFOs who responded to the late-November-to-early-December survey after the U.S. Senate passed its version of the tax cut bill, optimism spiked to 73, which is the highest U.S. CFO optimism level ever recorded. CFOs’ confidence in the performance of their own companies also strengthened in the quarter, as the optimism index rose to 71.3, up from 70.2 in September. In a reflection of that optimism, U.S. CFOs projected that both capital spending and employment at their firms would increase by a weighted average of 3.2% in 2018. 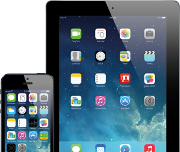 They also forecast average earnings growth of 5.6% and tech spending growth of 4.8%. To finance some of this, U.S. CFOs expected to be able to increase product prices. On average, surveyed CFOs said the prices of their own firms’ products would increase 2.7% in 2018. 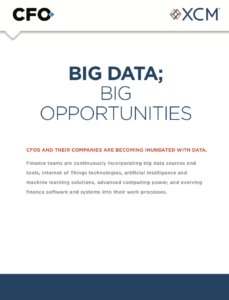 While CFOs’ moods are buoyant, they know full well that a growing economy boosted by high employment has a distinct down side — difficulty finding the workforce and talent to execute on their plans and investments. In the fourth quarter, the proportion of firms that indicated they were having difficulty hiring and retaining qualified employees was at a two-decade high for the survey — 43% of CFOs called the issue a top concern. U.S. firms said they plan to increase employment by a median of 2% in 2018. But they also expected to pay higher wages to achieve that increase. They forecast median wage growth of about 3% over the next 12 months. Wage growth should be strongest in the tech, energy, and retail/wholesale industries, according to the survey results. After the labor market, the next biggest concern among U.S. CFOs was also human-capital related: the cost of employee benefits. Health-care costs are expected to rise by more than 8% in 2018. Nearly half of U.S. CFOs surveyed indicated that the cost of employee health benefits crowded out their ability to spend on long-term corporate investment. Health-benefits costs ranked even higher than government regulation and (prior to the U.S. tax cut) corporate taxes in that respect. On the list of CFOs’ top concerns, data security issues rose to third place, its highest ranking ever, followed by government policies, regulatory requirements, and employee productivity. While it’s tempting to attribute the forecast of higher tech spending and employment at many U.S. firms solely to CFOs’ sunny disposition over a tax cut, the truth is that organizations are also being pushed by competitive forces, namely, the overall rapid pace of innovation. 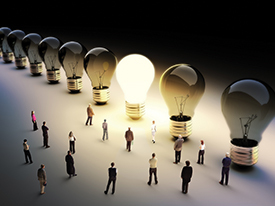 In the fourth-quarter survey, 62% of CFOs indicated the pace of innovation at their firms and within their industry had picked up in the past three years. Among those companies, 63% indicated the rapid pace of change had caused their firms to focus more on the near-term, and 40% said they now choose projects with shorter lives. CFOs at those firms also indicated that they have had to invest more to keep up. As a result of more rapid innovation, 76% of respondents indicated they boosted capital spending and 46% said they increased research and development outlays. 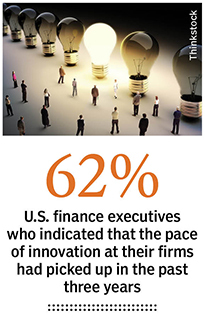 Nearly one-third (31%) said innovation has spurred them to tackle ambitious, “moonshot” projects. One potential constraint on all of these plans for 2018 could be the stamina of CFOs. In a series of special questions, the survey found that finance chiefs would like to spend less time at their jobs. They spend two-thirds of their waking hours working, they said, and many would prefer to be on the job much less than that. The preference to work fewer hours was pervasive, regardless of the current number of hours worked. Most CFOs who work 80% of their waking hours would prefer to work between 50% and 60% instead, while CFOs who currently work 50% of waking hours would prefer to work 40% or fewer. Those trends held across industries and around the world. The typical CFO of a company in Asia works 73% of his or her waking hours, slightly higher than CFOs in Europe (72%), Africa (70%), and Latin America (69%). CFOs from all regions indicated they would prefer to work about 20% fewer hours per week. • Optimism among finance chiefs in Canada remained strong, hitting an index score of 64. Capital spending was forecast to increase by about 4% and employment by about 2%, on average, in 2018. • Optimism in Europe jumped to 66.9 this quarter, the highest level in a dozen years. Capital spending was projected to increase 4.8% and full-time employment 3.9%. For the second consecutive quarter, the top concern among European CFOs was attracting and retaining qualified employees, followed by regulatory requirements, government policies, and data security. • Optimism was also strong in Asia, clocking in at 66.3. Median 5% growth in capital spending and 2% employment growth were expected in 2018. Difficulty attracting employees, economic uncertainty, and regulation and government policies were top concerns. • Latin American optimism continued to rebound in most countries, climbing to 73 in Mexico, 71 in Peru, and 61 in Brazil. In stark contrast, optimism was only 28% in Ecuador. CFOs projected that median capital spending growth in the region would be 5% next year, while median employment would be flat. Economic uncertainty was the top concern among Latin American CFOs, with 62% of firms listing it as a top four concern. They were also worried about governmental policies, weak customer demand, and productivity. • Business optimism in Africa increased 1 point to 52.5 this quarter, still the world’s lowest. Capital spending was forecast to increase by about 1% and employment by 3% in 2018. The biggest concerns for African CFOs were economic uncertainty, governmental policies, and currency risk. 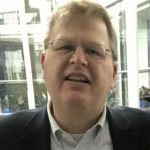 Source for all charts: Duke University/CFO Magazine Global Business Outlook Survey of finance and corporate executives. Responses for the current quarter include 292 from the U.S., 74 from Asia (outside of Japan), 22 from Japan, 148 from Europe, 215 from Latin America (including Mexico), and 55 from Africa. 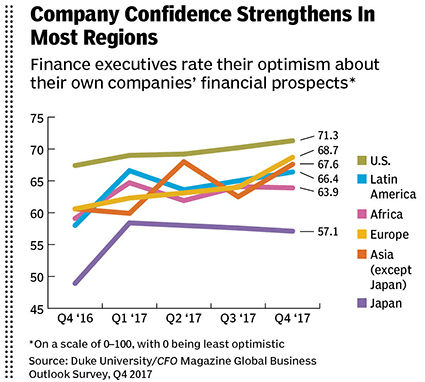 About 20% of finance chiefs admit their companies' systems have been hacked, yet their level of optimism stays at a record high: Duke/CFO Outlook Survey. Only one in five finance chiefs see themselves moving into the top job. Are they having a crisis of confidence—or being realistic? The Duke/CFO Business Outlook Survey finds optimism among U.S. finance chiefs lifted by the election of Donald Trump.